Exposure: 8 x 180 sec IR/UV Block Filter (1x1), 6 x 90 sec RGB Exposures (2x2). Processing: Images were captured with Artemis Capture (as FITs). Aligned/stacked in Registax 3 and saved as FITS. IR/UV Block (Luminance), and Color channels were scaled and color balanced in Astroart. Channels were co-registered in Astroart. Very slight Central Gradient removal was done on the Luminance data in Astroart. Curves and Levels applied in Photoshop to optimize object features. Final LRGB combine was done in Photoshop using Luminance Layering (or LLRGB) - G2V calibration factors and Atmospheric Extinction factors were applied. Selective sharpening was applied to nebula features in Photoshop with a layer mask. Astronomy Tools noise reduction was applied at 50% opacity on the final image. Final Image size is approximately 1392x1040. All exposures in this image were guided; North is up in this image. 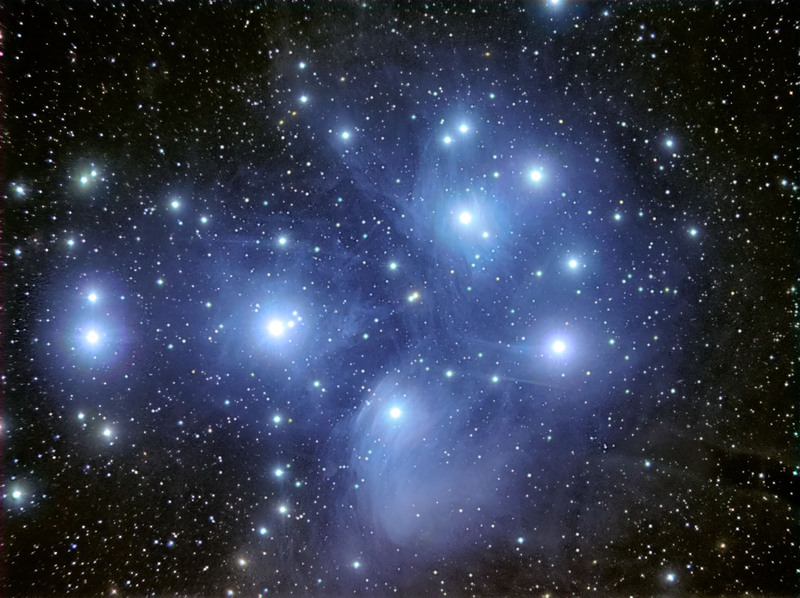 M45 is also known as the Pleiades, or Seven Sisters Nebula. The object is a star cluster embedded in gaseous material resulting in a reflection nebula. The nebula material is not believed to be a remnant of the cluster formation, but instead, the cluster has encountered material from a larger molecular cloud. M45 is a relatively close cluster at a distance of 380 light years from Earth. This image replaces and earlier image that can be seen in the Archives here . The Horizontal FOV is 90'. Image center is located approximately - Equatorial 2000: RA: 03h 46m 16.06s Dec: +24°11'23.26"